“Solo: A Star Wars Story,” the second of the “Star Wars” anthology films, focuses on Han Solo (Alden Ehrenreich) a couple years before the events of A New Hope. 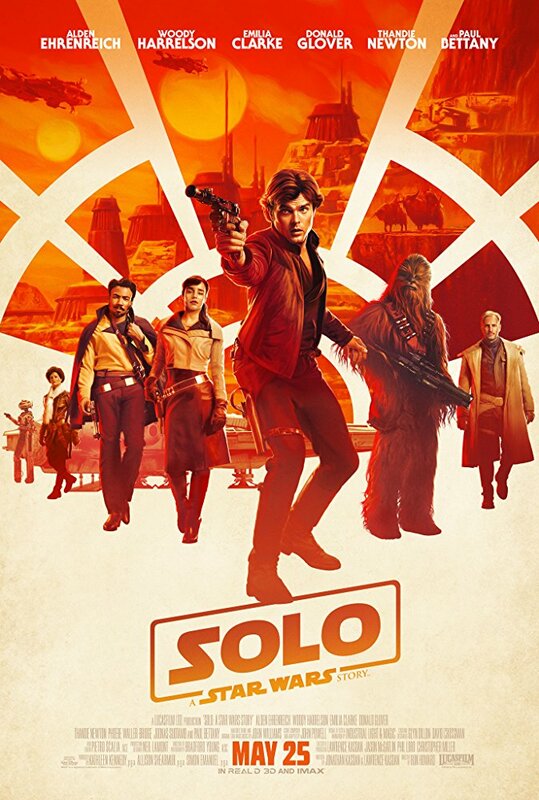 It explores the life of Han Solo and his adventures with Chewbacca (Joonas Suotamo), Lando Calrissian (Donald Glover), and other characters. It begins with the couple Solo and Qi’ra (Emilia Clarke) who are separated in an attempt to escape the dreadful planet of Corellia, in which most of the planet is enslaved by a creature named Lady Proxima (Linda Hunt). Solo manages to escape. Years later, he becomes a smuggler in a crew led by Tobias Beckett (Woody Harrelson) and meets Chewbacca for the first time. Beckett, Solo, and the rest of their crew are hired to steal a high-priced fuel, but the plan goes askew, leaving them deeply in debt to mob-boss Dryden Vos (Paul Bettany). In meeting Vos, Solo also coincidentally meets Qi’ra, who now works closely with Vos. They are sent on a mission to retrieve more of the fuel and get back what they lost. They’ll need a ship, which is where Lando Calrissian comes into play. With the Millennium Falcon, they set out to pay back their debts but ultimately, their plan is to just stay alive. For any Star Wars fan or geek, this movie is full of references and pure fan service. We find out how Solo made the Kessel run in under 12 parsecs, as well as the origin of Solo’s gold dice. However, that isn’t all it offers. The film is dark, full of action both on the ground and in space. It explores the reality of wars in space through Solo’s joining of the army and through Calrissian’s droid L3-37 (Phoebe Waller-Bridge) sparking a droid-uprising. The actors upheld the legacies of Solo and Calrissian, although I would have enjoyed more screen time for Glover, with his smooth-talk, style, and unique mannerisms. Ehrenreich plays a decent Solo, but some of his act seems a bit forced — not something a young Harrison Ford would portray. L3-37 absolutely steals each scene whenever she appears. The film as a whole doesn’t add much to the Star Wars universe, it only goes into more depth of its background. Ron Howard did an amazing job in piecing this film together and had the audience cheering when Solo and Chewbacca sat in the pilot’s seats for the first time. The stakes were lower in this film, but with the introduction to newer characters and a different type of plot, compared to other Star Wars films, this story opens up new opportunities for future Star Wars Stories. It taught us that a Star Wars film doesn’t have to all be about saving the galaxy, or light saber battles, or finding the definite line between good and bad. It is one of the realest films in the series in that it doesn’t have people with mystical powers, or planet-destroying tech. Instead, it looks at the aspects of war and its reality. “Solo: A Star Wars Story” releases in theaters May 25.